For other uses, see Ayr (disambiguation). Clockwise from top-left: Place De Saint-Germain-en-Laye, Robert Burns statue, Wellington Square Gardens, The Wallace Tower and Burns Statue Square. 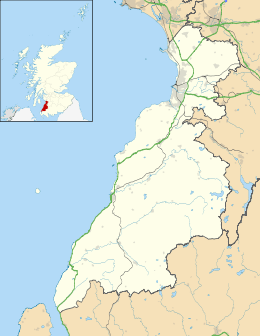 Ayr (/ɛər/; Scottish Gaelic: Inbhir Àir, "Mouth of the River Ayr") is a large town and former Royal Burgh situated on the west coast of Ayrshire in Scotland, United Kingdom. It is the administrative centre of the South Ayrshire Council area and historical county town of Ayrshire. Ayr is currently the most populated settlement in Ayrshire and is the 12th most populous settlement in Scotland. The town was established as a Royal Burgh in 1205, serving as Ayrshire's central marketplace and harbour throughout the Medieval Period and remaining a well-renowned port across the Early Modern Period. On the southern bank of the River Ayr sits the ramparts of a Citadel constructed by Oliver Cromwell during the mid-17th Century. 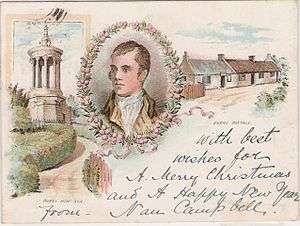 Towards the south of the town is the birthplace of Scottish poet Robert Burns in the suburb of Alloway. With the expansion of the railway during the 19th Century Ayr soon developed into a seaside resort. This remains the case today with tourism occupying a significant sect of the local economy in Ayr through the opening of a Butlin's holiday park on the southern headlands of the town and through the continued presence of the Gaiety Theatre, which ran various shows across the late 20th century attracting performers from across the United Kingdom. Politically, Ayr is considerably more Conservative-voting than the remainder of Scotland, being represented by a Conservative MP continuously for a period of 91 years – from 1906 (as part of the Ayr Burghs constituency) until 1997. The town forms part of the Ayr constituency in the Scottish Parliament, the first Conservative constituency seat in the Parliament, which has been represented by Conservative MSP John Scott since a by-election in 2000. The town is now marginally contested between the Conservatives and the Scottish National Party (SNP). In the UK Parliament Ayr is situated within the Ayr, Carrick and Cumnock constituency which is currently represented by SNP MP Corri Wilson. Ayr is one of the largest retail centres along the south of Scotland and was recognised as the second healthiest town centre in the United Kingdom by the Royal Society for Public Health in 2014. Ayr has hosted the Scottish Grand National horse-racing steeplechase annually since 1965. The town also accommodates the headquarters of the Ayr Advertiser and Ayrshire Post newspapers and the West FM radio station. The name Ayr can be traced back to a pre-Celtic word meaning "watercourse". The name was used before the establishment of the Julian calendar as a name for the River Ayr. 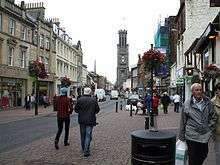 Ayr was founded as a market burgh town in 1205 by King William the Lion. It was formerly named 'Inverair' or 'Inverayr', meaning "mouth of the river Ayr", yet this was later abbreviated to 'Ayr'. Elements of the former name remain present within the Scottish Gaelic name for Ayr – Inbhir Air. Since 1261 annual fairs were held in the town. At this time the town had a recorded population of 1,500 and served as a major port on the west coast. The town was occupied by England from 1301 until 1312 as part of the Scottish Wars of Independence. On 26 April 1315, a Parliament of Scotland was held in Ayr by Robert The Bruce at St. John's Tower by the sea. Later, in 1652, the town was used as a base and fortress for some of Oliver Cromwell's men. Cromwell established a large fortress along the mouth of the River Ayr and erected walls around the area just south of the River's mouth - most of these walls remain present to this day. St John's Tower, which sat around the centre of the fortress, was originally part of a large church yet this was knocked down during the construction of the fort with the tower being used for military practice; it is now protected by "Friends Of Saint Johns Tower" (FROST) residents in the "Ayr Fort Area" which sits atop the former site of the citadel. A permanent military presence was established in the town with the completion of Ayr Barracks (later known as Churchill Barracks) on the citadel site in 1795. Ayr forms part of the Westminster constituency of Ayr, Carrick and Cumnock. This constituency includes Carrick in South Ayrshire in addition to Doon Valley, Cumnock and New Cumnock in southern East Ayrshire. The seat is currently held by the Scottish National Party's Corri Wilson, who was elected as the Member of Parliament at the 7 May 2015 UK general election. The Central Ayrshire constituency runs north of the Ayr, Carrick and Cumnock constituency. It takes in the towns of Irvine, Kilwinning, Prestwick, Troon and rural Kyle, running into Annbank. 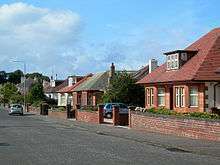 It also incorporates the Woodfield area of Newton-on-Ayr and is represented by SNP MP Philippa Whitford. In previous elections Ayr was represented in Westminster as part of the Ayr Parliamentary constituency, the boundaries of which included elements of Prestwick, Troon and rural South Ayrshire. The seat was abolished in 2005 to be replaced by the Ayr, Carrick and Cumnock and Central Ayrshire constituencies which were subsequently represented by MP's belonging to Labour, and later, the SNP. From the seat's creation in 1950 until the 1997 general election Ayr was continually represented by MP's from the Conservative Party. George Younger served as Member of Parliament for the constituency for most of this period - serving as MP for Ayr from 1964 to 1992. In 1997 the boundaries of the constituency were altered in a move which saw the Conservative areas of Alloway, Doonfoot and Masonhill alongside parts of Kincaidston and Forehill being transferred to the neighbouring Carrick, Cumnock and Doon Valley constituency, benefiting the Labour Party. Prior to this Ayr formed part of the Ayr Burghs constituency which combined various towns along the Ayrshire coast such as Irvine, Troon, Prestwick, Ardrossan and Saltcoats: this seat was held by the Conservatives from 1906 until the constituency's abolishment in 1950, making Ayr the longest seat to be held by the Conservatives in Scotland at over 100 years. At the Scottish Parliament Ayr exists as a constituency seat and has been represented by Conservative MSP John Scott since 2000. It was the first constituency in the Scottish Parliament to elect a Conservative MSP. The constituency also includes the towns of Prestwick and Troon. 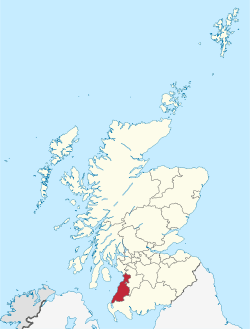 Regional MSPs that represent the South Scotland electoral region, and by extension represent the town of Ayr, are: Joan McAlpine (Scottish National), Emma Harper (Scottish National), Paul Wheelhouse (Scottish National), Rachel Hamilton (Conservative), Brian Whittle (Conservative), Claudia Beamish (Labour) and Colin Smyth (Labour). As a former Royal Burgh, Ayr had a Provost as chief magistrate of the burgh council and the earliest recorded provost is Nicholas de Fynvyk. The title of provost was retained by Kyle and Carrick District Council and South Ayrshire Council for their civic heads. The role of provost is now apolitical and carries a number of duties including chairing meetings of the council, acting as civic head representing South Ayrshire Council, promotion of South Ayrshire Council and networking with various organisations such as local businesses. A chain and robes are worn by the provost while undertaking their ceremonial duties. The provost's chain was donated in June 1897 by James McLennan who was a Glasgow wine and spirit merchant who was born in Coylton and lived in Ayr. The official provost's robes have been provided by the council since 11 June 1923. In addition, South Ayrshire Council erects lamp posts with the Royal Burgh Coat of Arms emblazoned on the diffusers outside the official resident of the provost - this has been undertaken since 1854. The current provost is Labour councillor Helen Moonie. Ayr is a coastal town which lies on the mouth of the River Ayr. The river then flows out into the larger Firth of Clyde estuary. From the coast the Isle of Arran can be seen, and on a very clear day, the northern tip of Northern Ireland. It is within the region of Strathclyde. Much of the land in and around this area is very flat and low lying, used for rearing dairy cattle. Towards the south of Ayr however the land is higher than most areas in the county of Ayrshire, an example of this being the Brown Carrick Hill which is situated due south of Doonfoot. Ayr lies approximately 35 miles (55 km) southwest of Glasgow. 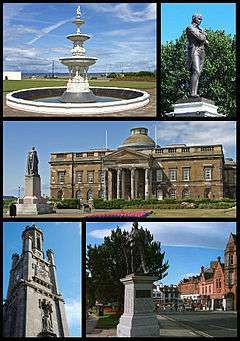 The urban area which encompasses Ayr is defined by the General Register Office for Scotland as the adjoining localities of Ayr, Prestwick and Monkton − this is the 12th largest urban area in Scotland. The nearest official Met Office weather station to Ayr is Auchincruive, about 3 miles (5 km) to the north-east of Ayr town centre. The area experiences very cool summers and somewhat mild winters. The air is cooler during the summer due to its proximity to the sea as water has a major cooling effect on summer temperatures. During the winter months the reverse happens and the sea air has a major warming effect on the climate. The area rarely ever sees extremes due to the effects of sea air. Rainfall is generally plentiful throughout the year due to Atlantic weather systems sweeping in from the west. Compared with the rest of Scotland, the area rarely sees much mist and fog. This is because the land is relatively flat and low lying and with the wind blowing across the flatter land, this generally hinders fog from developing widely. This has made Glasgow Prestwick International Airport particularly well known as one of the less fog-prone airports in Scotland. Snowfall is rare in this part of Scotland because of the mild sea air. Ayr's industry has flourished over the years mainly because of the River Ayr. Ships that were built on the mouth of the River Ayr in the eighteenth century improved Ayr's economy. From 1883 to 1901, 143 ships and barges were built on the Ayr by Samuel B Knight and the Ailsa Shipbuilding Company. Repair work on the Ayr ceased in 1960 when Ailsa moved its operations to Troon. The north side of Ayr Harbour still operates as a commercial port today, mainly exporting coal, and extensive railway sidings still lead down from the main railway line near Newton-on-Ayr station. In addition, the River Ayr and River Doon were used for the fishing of whitefish and salmon. These were then exported from Ayr Harbour. Manufacturing of textiles such as carpets and lining was important to Ayr's economy until the factories closed in the 1970s. This caused mass unemployment in Ayr. Many of the old factories are still standing and can be seen on McCalls Avenue and Walker Road in Lochside, North Ayr, though many are derelict and unsafe. There was a large factory engaged in the production of fertilisers and other agricultural products. This has since closed, but parts of the old complex are sublet by local businesses. Ayr has developed as the central retail hub in the south of Scotland after the opening of the town's first department store, Hourstons, in 1896. In the 1970s the opening of stores such as Marks and Spencers and Ayr's first shopping centre, the Kyle Centre (1988), encouraged an expansion in the local economy. Heathfield Retail park, an out-of-town retail park, opened in 1993 with shops such as Halfords and Homebase. Ayr Central Shopping Centre opened in March 2006, housing shops such as Debenhams and H&M and underparking for 500 cars. In December 2014 Threesixty Architecture received planning permission to refurbish the Kyle Centre by reinventing it as a centre of leisure through the creation of a new cinema complex among other new features. 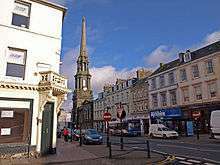 As of 2014 Royal Society for Public Health found Ayr's High Street to be the second healthiest in the United Kingdom behind Shrewsbury. In 2016 research conducted by the Local Data Company suggested that Ayr had among the highest number of shops per head in the United Kingdom at one shop for every 270 people. During the 19th and 20th centuries Ayr became a popular holiday resort. This was due to its fine sandy beach and its popularity was increased by the building of the rail link to Glasgow in 1840. A79 — main road running through Ayr and linking Ayr with Prestwick and its airport. A77 (M77) — Ayr by-pass stretching from Glasgow to Stranraer. It was built in 1971. A70 — running from Ayr to Edinburgh. Eight local bus services operated by Stagecoach West Scotland serve Ayr and Prestwick. Express coaches to Glasgow Buchanan Street operate every 30–60 minutes. Ulsterbus operate bus services to Belfast via Stranraer Ferry service on Stena Line. The Ayr railway station has services to Glasgow Central station with a half-hourly service except on Sundays. There are regular services to Edinburgh Waverley, Stranraer, Girvan, Kilmarnock, Dumfries, Carlisle and Newcastle. These services are operated by SPT/Abellio ScotRail. The railway station provides rail and sea connections via Stranraer for the connecting bus to Cairnryan for either the Stena Line ferry service to the Port of Belfast or the P&O Ferries service to Larne Harbour connecting with Northern Ireland Railways via Carrickfergus and Jordanstown to Belfast Central and Belfast Great Victoria Street. There is also the connection via Troon on P&O Ferries on a seasonal basis to Larne Harbour. The town is served by the Glasgow Prestwick International Airport just 2 miles (3 km) north from Ayr, which offers regional and domestic air services across Europe and the British Isles. Further destinations are available from Glasgow Airport, which is accessible by train to Paisley Gilmour Street for the connecting bus to the airport. In relation to Ayr, Glasgow Airport is 35 miles (56 km) away. Although the town does not have any ferry services from its harbour, it is in close proximity to ferry services to Northern Ireland. Troon, 5 miles (8 km) north of Ayr, has a seasonal service to Larne onboard P&O. Regular rail services to Troon and Barassie operate every 30 minutes from Ayr railway station. Cairnryan, 60 miles (100 km) south of Ayr, has up to eight daily departures to Belfast. The Church of Scotland is the main denomination in Ayr with nine churches spread throughout the town. The Roman Catholic Church has two churches and a Cathedral - previously located at the Good Shepherd Cathedral which has been demolished. There is also a Baptist Church and Evangelical church in John Street, a Latter-Day Saints Church at Orchard Avenue and the Southside Christian Fellowship in Ayr Town Hall. Ayr is also home to two Orange Lodges. At the United Kingdom Census 2001, Ayr had a population of 46,431, a fall of -3.2% on 1991. Mid-2008 population estimates placed the total resident population at 46,070 making Ayr the 12th largest urban area in Scotland. The 2011 census has shown that Ayr’s population has grown by around 0.9% since the 2001 census - this surpassed the population growth of Ayr and Prestwick which only grew by 0.63% which fell short of the national population growth of Scotland of 4.61%. In 2001 nearly 0.36% (167) people in the town could speak Scottish Gaelic - this fell to 0.34% (161) in 2011. South Ayrshire Council provides no educational support for the language. There are also several partnership centres and nursery classes held within primary schools within Ayr. Prestwick Academy is located within the neighbouring town of Prestwick and provides education to pupils who are resident within Ayr but fall within its catchment area. Mainholm Academy was a former secondary school located within Ayr and was closed due to safety concerns. Ayr is home to The Gaiety Theatre. Built in 1902, reconstructed after a fire in 1904, its façade remodeled in 1935, and further reinstated after a fire in 1955. In 1995, an annex was constructed, including a new café, box office, dressing rooms and studio space. After a faltering start, which saw several years as a cinema after WWI, the theatre was bought by Ben Popplewell, from Bradford who already had a track record of success running the Pavilion theatre on Ayr seafront. For fifty years the Popplewell family ran the theatre – latterly as part of the Glasgow Pavilion business. During this time the Gaiety developed a reputation as a variety theatre with a 'summer' variety show – the Gaiety Whirl – which ran for 26 weeks at its height. Many Scottish and UK stars appeared regularly on its stage, and several started their careers there. The programme offered more than a summer show however, with several weeks of Shakespeare and regular transfers from Glasgow Citizens theatre, being part of a varied offer. After seventy years in private ownership the local council acquired the Gaiety theatre freehold in 1974. It then operated as a municipal theatre under direct local authority management. After many years of successful operation the theatre began to lose audiences and the council felt the revenue subsidy it provided and the requirement for capital investment required a new approach. In January 2009 the theatre closed, leaving Ayr without a theatre. The closure was met with considerable opposition and dismay among many Ayr residents, particularly since it appeared that the required capital and revenue investment to reopen the theatre would not be available. A public meeting attracted over 400 attendees, the future of the theatre was a key issue in the local press, many Scottish performers expressed their dismay and there was extensive discussion on social media. In early 2009 South Ayrshire Council invited tenders to take on the theatre management. The Ayr Gaiety Partnership (AGP), a charity formed for the purpose in Summer 2009, secured preferred bidder status. Just over three years later, having secured financial backing from the council and Scottish Government, as well as from local fundraising, AGP took on a 99-year lease of the theatre. To the north of Ayr is the adjoining town of Prestwick, which is famous for its golf and aviation industries, thanks to the presence of Glasgow Prestwick International Airport. Only 5 miles (8 km) north of Ayr is Troon, a golf and seaside resort which has hosted British Open Championship. Ayr has three golf courses in Bellisle, Seafield and Dalmilling, as well as a private course called St Cuthberts. The area is synonymous as a seaside resort, with the south of the town housing the Craig Tara and Haven (formerly Butlins) holiday parks. The suburban village of Alloway to the south of the town is also well established for its associations with the poet Robert Burns. Further south, the fishing village of Dunure takes in a ruined castle which was formerly owned by the Kennedy family. In 1973, Ayr hosted the National Mòd. The radio station West FM is based in Ayr and broadcasts on 96.7FM. West FM is the main broadcaster in the Ayrshire area. The Ayrshire Post, serving all parts of Ayrshire, and Ayr Advertiser, serving the towns of Ayr and Prestwick, newspapers are also based in Ayr. The Ayr Advertiser is Scotland's oldest weekly newspaper. Ayr Racecourse is a well-known racecourse in Scotland and hosts both National Hunt and flat racing. It has the largest capacity in Scotland for horse racing. Notable events include the Scottish Grand National (April) and Ayr Gold Cup (September) as well as several night meetings. It was recently put up for sale by the owners and included the Western House Hotel as part of the potential sale. Main article: Ayr United F.C. Ayr has a senior football team, Ayr United F.C., who play at Somerset Park in the Scottish Championship. They reached the final of the 2001–02 Scottish League Cup competition. The club was formed in 1910 with the merger of Ayr F.C. (who were formed in 1879 by the merger of Ayr Thistle and Ayr Academical football clubs) and Ayr Parkhouse F.C..
Whitletts Victoria F.C. are a Junior side from the Whitletts area of Ayr. The town has a strong history of ice hockey up to professional standard but no longer hosts a professional ice hockey team. The most recent professional team were the Ayr Scottish Eagles who played in the British Superleague between 1996 and 2002 based at the Centrum arena. During this time they have success most famously their grand slam season in 1997–98 winning all 4 titles available and becoming British Champions. The following season seen them compete in the European Hockey league with famous victories home and away to Russian champions AK Bars Kazan. Eagles finished 3rd in a group also containing clubs from Germany and Czech Republic. The Centrum closed in 2003 and was demolished in 2009 to make way to a Sainsbury supermarket. Ayr's rugby union team, Ayr RFC, play at Millbrae and are reigning Scottish Cup Champions and Scottish Premiership Champions 2012/2013, and won the 2008/09 Scottish Hydro Premiership. Ayr RFC have twice competed in the British and Irish cup involving clubs from Scotland, England, Wales and Ireland. A rugby league team, Ayr Knights ARLFC, play at Auchincruive. Ayr Cricket Club play at Cambusdoon, and occasionally act as host for Scotland matches. Ayr Curling Club play at the curling rink in Limekiln Road and Ayr's cricket team plays in Cambusdoon, Burns Wicket. Ayr only has one leisure centre, this being the Citadel, which opened in 1997, located at the mouth of the River Ayr and at the seafront at the South Harbour area. Its facilities include a main hall measuring 34 m × 27 m (112 ft × 89 ft). This hall can accommodate various sports including 5-a-side football, basketball, volleyball, netball, indoor hockey, indoor cricket practise, badminton and short tennis. As well as individual sports, sporting events and competitions, the hall has hosted exhibitions, concerts, trade fairs, election counts and awards ceremonies. The Citadel is an expansion of the Ayr swimming pool, which opened in 1972. The Citadel features a Dance Studio approx 124 m2 (1,330 sq ft). It is predominantly used for dance or exercise classes but also accommodates martial arts groups and drama workshops and two glass backed squash courts. The Citadel Leisure Centre in Ayr is home to South Ayrshire Volleyball Club as well as being the town's only public swimming pool and diving pool. The leisure centre has squash courts, a gymnasium, dance studio, cafeteria and adjacent salons and youth club. An Ayrshire basketball team, the Troon Tornadoes, play their national league matches at the Citadel, despite not being an Ayr team. Additionally, Ayr has a Strathclyde league basketball team, Ayr Storm. Ayr is also home to Scottish Bowling. The greens at Northfield host the Bowls Scotland and SYBA finals each year as well as the Hamilton Trophy final. Both the Ladies and Gents World Championships have been held at the Northfield complex as have international series and the Atlantic Rim Championships. Ayr Indoor Bowling Green is the oldest existing indoor bowling stadium in the world. Speedway was staged at Dam Park in 1937, when two meetings, organised by Maurice and Roland Stobbart from Cumbria took place, featuring riders who raced in the north of England, at venues such as Workington and Hyde Road in Manchester. Ayr has a sandy beach with an esplanade. This is very popular with joggers and day-trippers. Whitletts Activity Centre also serves the town of Ayr. It has an 11-a side outdoor soccer pitch and an indoor 5-a-side football pitch. Near Whitletts Activity Centre there is also a 5-a-side football complex called "Pro Soccer". The NHS Ayrshire and Arran Health Board serves South, East and North Ayrshire – a part of Ayrshire and Arran's departmental headquarters is located in Ayr. Ayr is also the regional headquarters of the Scottish Ambulance Service for south-west Scotland that is located in Heathfield, next to the site of the old Heathfield Hospital. Ayr previously had four hospitals: Heathfield Hospital (originally a fever hospital, but latterly medical and ophthalmic), Seafield Hospital (a children's hospital), Ayr County (originally a voluntary hospital, and latterly confined to surgery) and Ailsa Hospital (a psychiatric hospital). Ayr Hospital was built in 1993 which replaced all but Ailsa Hospital which is still open. Hollybush House on the outskirts of Ayr is used by a charity for the mental health welfare of ex-members of the UK Armed Forces. ↑ "Mid-2012 Populations Estimates for Settlements and Localities in Scotland" (PDF). Retrieved 16 October 2016. ↑ "Archived copy". Archived from the original on 9 March 2016. Retrieved 2016-02-17. ↑ "Archived copy". Archived from the original on 8 March 2016. Retrieved 2016-02-17. ↑ Taylor, Iain (2011). Place-names of Scotland. Edinburgh: Birlinn Ltd.
↑ "Archived copy". Archived from the original on 15 March 2016. Retrieved 2011-10-11. ↑ "The Protectorate Citadel Of Ayr". Scots Wars. Retrieved 14 November 2014. ↑ "Barracks in Scotland". Scots at War. Retrieved 14 November 2014. ↑ "Lord Younger". Guardian. Retrieved 8 August 2015. ↑ "John Scott MSP". The Scottish Parliament. Retrieved 30 December 2012. ↑ "Ayr - MSPs: Scottish Parliament". Scottish Parliament. Retrieved 30 December 2012. 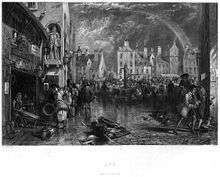 1 2 3 4 5 "Provosts of Ayr". South Ayrshire Council. Retrieved 10 January 2013. ↑ "Provost". South Ayrshire Council. Retrieved 10 January 2013. ↑ "Auchincruive Climate". UKMO. Retrieved 7 November 2011. ↑ "Auchincruive extremes". KNMI. Retrieved 7 November 2011. ↑ "averages 1971-2000". Met Office. 19 November 2008. Retrieved 9 June 2009. ↑ 'Kyle Centre, Ayr - Planning Submission' Archived 26 August 2016 at the Wayback Machine. ↑ 'Preston tops table of UK's "unhealthiest High Streets"' Archived 27 September 2016 at the Wayback Machine. ↑ Lambert, Tim. "A Brief History of Ayr, Ayrshire, Scotland". www.localhistories.org. Retrieved 11 October 2011. ↑ Edwin, Lawrence. "House of prayer in Ayr set to be 25 houses". Ayrshire Post. Retrieved 30 December 2012. ↑ "Worship With Us". Mormon.org. Archived from the original on 29 October 2009. Retrieved 9 June 2009. 1 2 "Scotland's Census Results". Scotland's Census Results Online (SCROL). Archived from the original on 17 July 2011. Retrieved 16 August 2011. ↑ "General Register Office for Scotland Mid-2008 Population Estimates for Localities in Scotland". Archived from the original on 1 January 2011. Retrieved 21 December 2010. ↑ "Census 2001". South-ayrshire.gov.uk. 6 April 2009. Retrieved 9 June 2009. ↑ "Find out about an area". The Scottish Government. Retrieved 29 November 2014. 1 2 "Nuersery Schools - Pre Schools in South Ayrshire". South Ayrshire Council. Retrieved 30 December 2012. ↑ "Primary Schools". South Ayrshire Council. Retrieved 30 December 2012. ↑ "Southcraig Campus". South Ayrshire Council. Retrieved 30 December 2012. ↑ "Secondary Schools in South Ayrshire". South Ayrshire Council. Retrieved 30 December 2012. ↑ "Catchment area". South Ayrshire Council. Retrieved 30 December 2012. ↑ "Mainholm Academy Closure". South Ayrshire council. ↑ "Welcome to Wellington School". Wellington School. Retrieved 30 December 2012. ↑ "Independent Schools in South Ayrshire". South Ayrshire Council. Retrieved 30 December 2012. ↑ "Libraries in South Ayrshire". South Ayrshire Council. Retrieved 31 December 2012. ↑ "Contact us | 96.7 West FM". West Sound Radio Limited. Retrieved 31 December 2012. ↑ "Contact the Ayrshire Post". Ayrshire Post. Retrieved 31 December 2012. ↑ "South Ayrshire Volleyball Club". Southayrshirevolleyball.org. Retrieved 17 August 2011. ↑ "Hall Bookings". South Ayrshire Council. Retrieved 8 September 2013. 1 2 Who Was Who in America, Historical Volume, 1607-1896. Marquis Who's Who. 1967. ↑ National Trust for Scotland. 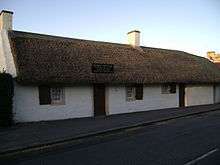 "Robert Burns Birthplace Museum". Retrieved 6 December 2015. ↑ "Accueil". Jumelagestgermainayr.fr. Retrieved 17 August 2011. ↑ "Ayr Town Twinning Association". South Ayrshire Unitary Authority. Retrieved 30 December 2012. Wikimedia Commons has media related to Ayr. Wikivoyage has a travel guide for Ayr (Scotland). Commentary & video on the barony of Montgomerieston in the Ayr Citadel.